Looking for an outfit for that special occasion? If you know exactly what you want, but can't find it ready made, why not make it yourself or have it made from our extensive and luxurious selection of bridal and evening wear fabrics. Looking for an outfit for that special occasion? If you know exactly what you want, but can't find it ready made, why not make it yourself or have it made from our extensive and luxurious selection of bridal and evening wear fabrics. If you browse through the pattern books (Vogue, Butterick, McCalls, Simplicity, Burda and New Look - now also KwikSew), you're sure to find something to suit your requirements. Helpful staff are on hand to deal with your enquiries and help you select that special fabric. A wide range of silks is available from stock, including hand woven Chinese dupion and Indian dupion (which can be ordered), in plain self colours and matching embroidered, but if we do not have what you want, we may well be able to order it for you. We have plain and embroidered chiffon and duchess satin, we have organzas, velvets, taffetas and tartans both in polyviscose and wool. Satins include acetate, faille, crepe backed, duchess and dupion backed. We have netting, veiling, georgette, laces, brocades and a small selection of cotton and rayon velvet, as well as beautiful stretch velvets. Our bridal accessories include trimmings such as ribbons, braids, beads, bows, tiara bases and flowers, pearls, sequins and crystals for decoration as well as bridal bags to complete the outfit! If there is something you cannot find, please do not hesitate to ask. We will try our best to help you. Mandors does not have a catalogue or price list, but if you email your enquiry, we will endeavour to answer any questions you may have. 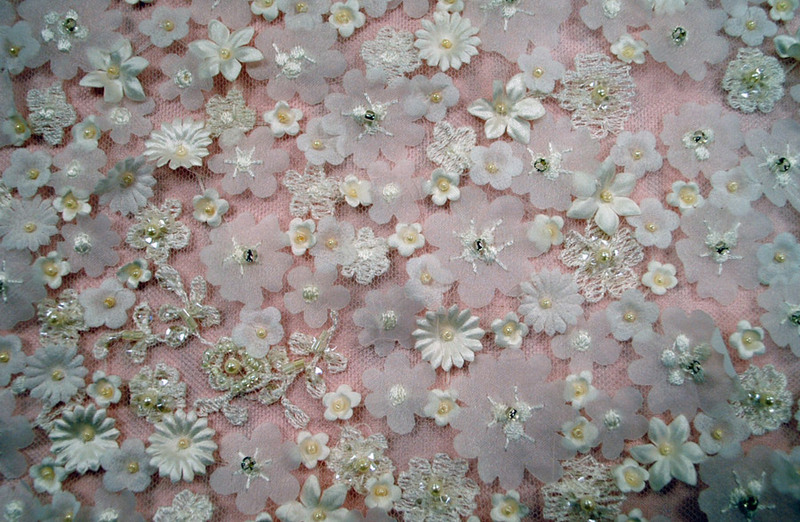 For samples, please send £2.50 for dress fabrics and £5.00 for bridal fabrics. Please specify fabric colour and type. Mandors is full of gorgeous laces, satins and crepes, as well as a selection of designer fabrics suitable for brides, bridesmaids and all the bridal party. So many fabrics to suit every taste.